This is it, ladies and gentlemen. A gold master containing the culmination of fourteen years of game development is now in production, discs filled with action, toilet humor, and attitude rolling off the line in preparation for Duke Nukem Forever's June 10 release. Gamers' collective hearts skipped a beat when Gearbox Software delayed Duke's return in March, the last in a series of delays that made the title the gaming legend it has become. 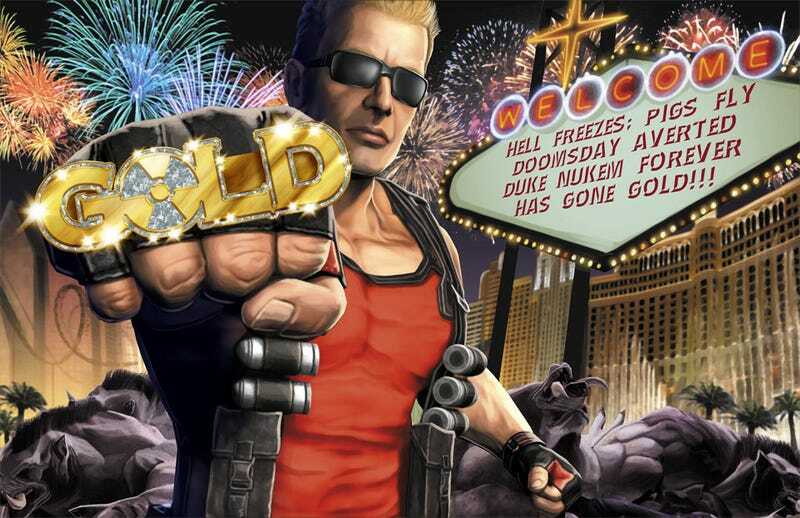 Originally announced in 1997, Duke Nukem Forever languished in development hell for over a decade, until 2K Games announced the title in development at Gearbox Software in September of last year. The game was supposed to be out this May, but won&apos;t be. It&apos;s been delayed. Again. "Duke Nukem Forever and its journey to store shelves is legendary," said George Broussard, creative director at 3D Realms. "It's an epic tale of four game development studios that banded together and did the unthinkable and shipped the unshipppable. When you play this game you will be reminded of that epic journey at every turn and in every small detail of the game. The character, attitude, interactivity, gameplay and political incorrectness combine to make a Duke Nukem game a unique gaming experience. In the timeless words of Duke Nukem it's finally time to 'Come Get Some'. Come be a part of gaming history." It's so real now I can almost touch it, though I don't think I'll truly believe until the game is in my hands, or better yet, in my console, actively playing. Until then there are still too many things that could go wrong. The factory might burn down. Maybe the wrong gold master was sent. The Rapture is still a going concern. It's Duke Nukem Forever. Anything is possible, including a June 10 release on the Xbox 360, PlayStation 3, and PC.